Alerton's new Ascent Building Management System is First to Combine BACtalk and Tridium's Niagara Framework® in a Single Controller. Software, Wall Sensors and Control Module All Designed For Simpler Monitoring and Control of HVAC and Other Building Systems. 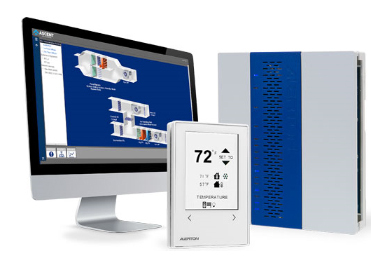 To help building owners better monitor and manage their heating and cooling related energy use, Alerton is rolling out its new Alerton® Ascent Building Management System, the first to combine in a single controller the industry standard BACnet protocol and Tridium's Niagara Framework® for more effective integration of multiple building systems. Ascent is comprised of three products designed from the ground-up for ease of use and consistency across control systems: Ascent Microset 4 wall sensor; Ascent Control Module global controller; and Ascent Compass® software. The product suite is designed to simplify monitoring and control of HVAC systems, and will offer an open protocol for integration with other building systems, including lighting; security/access control; fire and life safety; elevators and escalators; irrigation; and specialized needs such as emergency and critical systems monitoring in hospitals, and tenant billing for leased spaces in office buildings. "Alerton was first to offer a complete product line based on BACnet, the building industry's standard for open system interoperability," said Alex Radovan, Alerton general manager. "Now, we're first to bring together BACnet capability with Tridium's Niagara Framework within one controller. This integration provides unparalleled potential for monitoring and controlling numerous building systems from one platform in an easy-to-use, flexible automation system that’s suitable for a single building or an entire campus." Founded in 1981, and a business unit of Honeywell, Alerton is a leading manufacturer and pioneer of building automation systems for heating, ventilation and air conditioning (HVAC) equipment. In 1996, the company introduced Alerton BACtalk, the first product line based on BACnet, the building industry’s standard for open system interoperability. Alerton products are used in commercial and institutional buildings throughout the world, including high-rise offices, government facilities, universities, airports, hotels, schools and hospitals. www.alerton.com. Honeywell (www.honeywell.com) is a Fortune 100 diversified technology and manufacturing leader, serving customers worldwide with aerospace products and services; control technologies for buildings, homes and industry; turbochargers; and performance materials. Based in Morris Township, N.J., Honeywell's shares are traded on the New York, London, and Chicago Stock Exchanges. For more news and information on Honeywell, please visit www.honeywell.com.